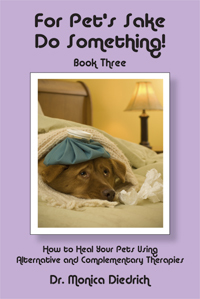 In book three of the series animal communicator Dr. Monica Diedrich provides you with clear information about a variety of effective healing modalities you can easily use at home. You’ll find information on Flower Essences, Essential Oils, Homeopathy, Magnetic Therapy, Massage and Reflexology, Sound, Color, Crystals, Incense, Acupuncture, Acupressure, Chiropractic and Hydrotherapy. Of course this book wouldn’t be complete unless you have clear information about Animal Communication. Important chapters about first aid kits, poison-proofing your home and how to provide for your pet when you’re no longer there, are just a few items that make this book unique. You will come to think of it as your “Pet Bible”.